Is a .22 Caliber Handgun Good Enough For Concealed Carry? Blog Do You Really Need A .22 Caliber Handgun? We say “it depends”. People seeking one do-all firearm would probably be better off with something shoulder-fired like a 12 Gauge shotgun. Heck, a 26 or 28” pump-gun with a spare rifle-sighted slug barrel could handle anything that roams North America, including all two or four legged threats. But of course, two-handed activities and/or the need for concealability call for something a whole lot smaller like a handgun. In the interest of economy, we might purchase only one, in which case, for maximum practicality, it really should be a centerfire; either a revolver or semiautomatic pistol with sufficient power for defensive purposes – and, perhaps, some subsistence capability tossed in. And herein lies the rub; a .22 rimfire of any type just doesn’t have much thump to begin with, especially when fired from a handgun. Even the more potent .22 Winchester Magnum Rimfire (.22 WMR) runs out of gas, delivering short-barrel velocities more on the order of .22 Long Rifle cartridges fired from a rifle. And nobody touts a .22 LR as an optimum defensive choice. Oh, it can certainly be lethal, but actual data begs for something bigger. On the other hand, a .22 revolver or pistol will work fine for filling the pot when it comes to smaller game like squirrels or rabbits. 1: First, most such quarry, whether furred or feathered, presents a challenging target, even when stationary. 2: Second, most folks including many who claim otherwise, are actually marginal handgun shots. Concerning the latter statement, we (the fellow cadre of a state firearms training unit) have had ample time as full-time firearms trainers to observe the efforts of determined shooters, including many with military or law enforcement backgrounds. We’re talking thousands of shooters during three decades. Yes, some of them really can shoot and, if so, we pretty much leave them alone within the acceptable bounds of safety and defensive doctrine. A good many more though think they can shoot, but actually can’t; at least not at the start of their multi-day training. Many can hit a cardboard humanoid silhouette at 10-15 paces, but draw a coffee can lid-size circle on it and the outcome will probably change (we start everyone out with 8” circles at only 7 yards). So, odds indicate those contemplating a .22 for hunting purposes will be better served by a rifle. In fact, a beater $100 bolt-action single-shot from a used rack will probably ensure success before the finest rimfire target pistol. It boils down to this: Shooting a handgun is hard! BUT, it’s not impossible. You get there like you get to Carnegie Hall; with the proper skill-sets and lots of practice. If NO handgun is present, you could seize upon an opportunity to acquire similar centerfire and rimfire models, possibly beginning with the latter. Getting uppity, you can then refer to the .22 as your understudy gun; just a fancier way of describing its familiar function. So equipped, you could hone your handgun skills without fear of breaking the bank. After all, a 500-round brick of basic .22 LR cartridges probably won’t cost more than two boxes (100 rounds) of the most affordable 9mm Luger cartridges. As another benefit, both recoil and noise will be more tolerable, permitting greater attention to marksmanship fundamentals (stance, grip, breathing, sight picture, and trigger control). During this period, the centerfire version could languish in a safe or dealer’s shop, pending the inevitable refinement of skills (or more loot). Once it’s time for the transition, you’ll have an obvious leg up regarding operation and accuracy. By the way, most .22 handguns are accurate; probably more so than their centerfire counterparts. Rimfires undergo less breech-thrust so semiautos can be built with simple blow-back actions that cycle off a stationary barrel. On the other hand, mainstay 9mm, .40, and .45 ACP pistols use a locked-breech system involving a tilting barrel and reciprocating slide that can introduce subtle misalignments. Put a service-grade pistol in a mechanical Ransom Rest, and it’ll probably place 5 shots into around 2 ½ to 3-inches at 25 yards – still completely adequate for its intended purposes. Don’t be surprised though if a less expensive .22 pistol cuts that spread by half. Of course, revolvers all have fixed barrels so they tend to shoot quite well. In fact, revolvers ruled the roost for decades, offering good reliability and power through a simple-to-use firearm, at the expense of ammunition capacity. A six-shot double-action was the sidearm of choice for most civilians and law enforcement personnel until the late 1980s, when semiautomatic pistols arrived in force, driven largely by higher capacity. Which leads us to the next question: What type of handgun is best? Recommending a gun is a lot like nailing one ideal vehicle. One size doesn’t fit all, with a number of factors coming into play such as physique, strength, and experience. Complicating matters, there are a huge amount of choices. Those that follow are based on firsthand experience, S&W revolvers being one example in both centerfire and rimfire form. We still have a few mothballed M-65s dating from around 1991, and each has fired in excess of 50,000 rounds. They still work fine, too! Three decades after the pistol surge, much current revolver use centers on smaller double-action types (DAs) that offer safety and simplicity; important for concealment purposes. But, actually, given these traits, there’s really not a whole lot wrong with a larger version like a 4-inch S&W .357 Magnum Model 66 (which will also fire milder .38 Special loads). KISS can be good, especially under stress, and no one contests the authority of a full-strength .357 load. Beyond a feisty report, two drawbacks are limited capacity (in this case 6 shots), and somewhat slower reloads (which, with a swing-out cylinder and practice, can still be pretty quick). The latter function eventually relegated fixed-cylinder single-action types (SAs) like Colt’s six-shooters to sporting usage. However many sturdy SA revolvers still can be seen in wild places, and most are now built by Ruger. Either way, .22 shoppers are in luck. The prices that follow are approximate but may serve as a guide. D/A example The centerfire S&W shown in the photo is a slightly customized 4” M-66 .357; just an adjustable-sight version of our venerable M-65s. These medium-sized K-frames make a good all-around choice, and you can even buy a .22 LR as a stainless 10-shot M-617, or a blued 6-shot M-17. Looking for more of a “kit gun”, I dropped down to a 3” Model 63, which is built on S&W’s smallest J-frame. The lock-work is a bit different since J-frames use a coiled hammer spring in lieu of a K-frame leaf. The result is a somewhat heavier DA trigger pull but, once cocked, the SA pull is excellent like other S&Ws. The loader devices are just inexpensive speed-strips; better than loose rounds (eight .22 rounds for the M-63). A matching 6-shot K-frame might be smarter, but this M-63 is still capable of 2” groups or less at 25 yards. Since S&W rimfires are versions of their centerfire line, costs are similar ($635 – $700). 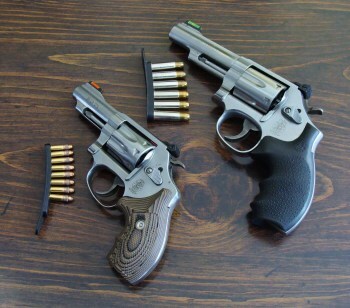 Ruger fans can acquire matching rimfire/centerfire DA revolvers of similar quality. Their stainless SP-101s are built like tanks, but more to kit-gun size. The GP-100s are a bit larger than S&W K-frames, but either will serve well as a general-purpose rimfire ($585 -$625). Other choices with which we have no real experience include some Charter Arms and Taurus rimfires, the latter with neat quick-change .22 LR/ .22 Magnum cylinders (prices run $350 – $450). SA types Those more interested in outdoor related uses could explore the Ruger line. The .22 Bearcat is kit-gun sized. The sturdier .22 LR Single-Ten ($540) harks back to the 1950s, nicely complimenting a series of somewhat larger centerfire Blackhawks; including a .357 version. At one point I enjoyed both, plus a larger .44 Magnum Super Blackhawk. My experience with competing Heritage SAs is nil, but a trusted FFL holder reports no real problems with them ($250). Some of these guns are also sold as dual-cylinder .22 LR/.22 WMR combinations (but expect significant velocity loss). Revolver note: All will function with a wide variety of loads such as CCI .22 Quiets, .22 shot-loads, .22 Shorts, and .22 CB Caps, although noise will be greater than a rifle. A .22 Magnum needs its own cylinder, which won’t safely fire these loads. 1911 example Today, almost every big-name pistol manufacturer sells a Government Model of some sort, most often in .45 ACP or 9mm. However, I wouldn’t rate one as a good beginner’s choice due to the “cocked and locked” design. Assuming you’re comfortable with hammer-back carry though, a 1911 has great .22 LR potential. The easiest route is a non-FFL conversion kit, and Kimber’s unit may be among the most popular. It’s cheaper and simpler than the no-longer-produced Colt version I once owned. The last-shot hold-open feature is absent to prevent deformation of the soft slide-stop notch. However, my Kimber unit shoots surprisingly well with a diet of high-speed .22 Remington Golden Bullets, cutting 25-yard 5-shot groups of around 1 ½ inches. Retail cost is around $340 with adjustable sights. Other conversion kits are sold by Jonathan Arthur Ciener (JAC), Marvel, Advantage Arms, and Tactical Solutions ($250 – $500). As for complete 1911-type .22s, Kimber used to sell dedicated .22 1911s, but they’re no longer cataloged. The Chiappa Firearms and Tactical Imports/GSG 1911 copies supposedly shoot fairly well, although costs are held down through the use of zinc alloys. Other options are the Browning Black Label, and Sig P938-22 Target Micro. The lowest cost imports are around $300; the others running higher. DA/SA types Beretta’s DA/SA M9A1-22 is a rimfire version of their 92 FS/M-9 ($400). Sig’s P226-22 Nitron is their rimfire P226 twin. In fact, centerfire Caliber Exchange Kits are even available in 9mm, .357 Sig, and .40 S&W, thanks to one common frame ($600). Striker-fired types Although clones seem scarce, S&W seized an opportunity to fill a rimfire M&P niche. We bought several S&W M&P-22s to support our inventory of over 200 M&P 9mms. The rimfires are used strictly for remedial training, where they help cure extreme cases of flinching. It’s been money well spent and the shooters all leave happy, although it’s hard to keep the instructors on a leash. Actually, these .22s have an internal hammer making them true SAs, but you’d never know that from their function or appearance. JAC (Ciener): Sells Beretta 92/96 FS, and similar Taurus PT-92/99s conversions, plus one for the SA Browning Hi-Power. Beretta: Offers a kit for the Model 92/96 (check for compatibility before a purchase). CZ USA: Lists a Kadet Conversion Kit, advertised to work with some CZ-75/85 Pistol-Series. Advantage Arms: Sells conversions for Glocks and XDs with last-shot hold-open. Check first. Tactical Solutions: Lists steel kits for some Glock models, again with last-shot lock-back. Conversion note: Many of the kits could require a break-in period, and some may prefer hi-speed plated bullets. Minor fitting could also be involved so if in doubt, contact the manufacturer. These aren’t centerfire clones. Instead, they’ve been designed from the ground up to deliver excellent rimfire performance. Three examples (among many other options) are the Browning Buckmarks, Ruger Mark IVs, and S&W’S Victories, all offered in various form. They all offer great accuracy, thanks to solidly mounted barrels and good adjustable sights, and all are actually SA types which incorporate an internal hammer tuned for optimum trigger pull. The controls will be familiar to many, consisting of 1911-type external safety levers, slide releases, and properly-located magazine buttons. The cleaning process is also simple (not true of previous Ruger Mark Series pistols, which can benefit from a Majestic Arms Speed-strip Kit). Mounting of an optical sight is another possibility for each but, either way, if you miss, I won’t be the fault of the gun. The best part: You can buy one, starting for around $400 – BUT, you will need a separate holster. Whatever you purchase, don’t forget a holster. Separate gear can jack up costs though, making a further case for a rimfire twin. Also, adjustable sights are worthwhile. They’ll permit spot-on corrections to accommodate various loads and, when it comes to .22 LR, results can vary. In fact, before stocking up, it’s worth shooting some groups for accuracy, as well as for function. Some combinations can work great, while others can be downright miserable. Also, readers may take exception to the comments about handgun proficiency. As noted before though, some people are actually darned good shots (maybe in part thanks to lots of previous shooting with .22s). For those uncertain, here’s a basic test. First dig out the handgun and ammo of your choice, whether centerfire or rimfire. Next, staple a 9” paper plate to a backer, retreat 15 honest paces, and fire 10 well-aimed shots. Then do it again with no misses or excuses allowed. In fact, bring a shooting witness, not only to turn up the heat but also for their turn in the barrel (go first to allow for pay-back comments). Got ‘em all in? If so, great; you’re an above-average shot! If not, review the rimfire choices. Next, think about the lethal zone of a rabbit. Actually, we only have larger snowshoe hares in my neck of the woods but still, the kill-zone is around 3” for a body-shot. Squirrels present even less and they’re often moving to boot so, it’s time for phase two: 10 more shots on a 3” circle from ten paces (one series will do). Nail all ten and you’re a very good shot. Hence the opening “it depends”. Do that and you might not need a .22 since well-placed centerfire FMJs won’t cause much meat damage. A possible indignity is, you could wind up with a group small enough to fit, but off-center. That’s where the advantage of good adjustable sights will become evident! That, and possibly a more accommodating handgun. It all boils down to proper sight picture and trigger-control. Release the trigger in such a manner that the sights remain undisturbed and you should have a hit. To that end, a good .22 can allow plenty of useful practice. Plus it’s lots of fun! Fun article, I’d suggest the author follow around more country raised boys and girls versus the average “range rat”. My point is this, I agree many if not most paper punchers who buy and fly with guns cannot shoot well. That said, there are far more of us that never attend a special range and paper punch, we grew up hunting, fishing and all around living – for those as I believe you did mean – a .22lr handgun is an appropriate and solidly beneficial addition. If one wishes to get the license a suppressed .22lr handgun really is an incredible varmint gun as well. Btw. I absolutely agree eg., smaller game and the difficulty measure there ! I have a Chiappa .22 auto and it does shoot very well. I have several Hertage Rough Rider .22 revolvers just for fun. I also have a Savage bolt action .22 rifle with a heavy barrel and it is an absolute tack driver. I once owned a Ruger 10/22 and I liked it but the accuracy was terrible.